The Tonkinese is a medium-sized cat with a sturdy, compact appearance similar to the Burmese and traditional Siamese cats. The breed comes in a variety of different colors and markings, including natural mink, champagne mink, blue mink, platinum mink, sable brown with points, champagne with points, blue with points, and platinum with points. Tonkinese are very vocal active cats that demand attention. They love to play, and get along great with kids and other pets. They are also very affectionate and intelligent. They can be strong willed and harder to train. Tonkinese don’t take to being ignored and need a lot of attention. They are active cats and are always on the go. Because they are so smart, they can get into mischief if not given plenty of toys and interaction. 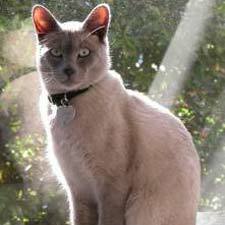 Because Tonkinese are so active, they are best matched with cats of their own breed, or with a breed that is equally active, such as the Siamese. The Tonkinese breed hails back to the Middle Ages, and was imported to England in the 1800s. Originally known as a Chocolate Siamese, the breed is actually a combination of Burmese and Siamese blood. In 1930, Dr. Joseph Thompson brought a small walnut-colored cat to California. Named Wong Mau, this cat went on to become a foundation cat for the Burmese and Tonkinese breeds in America. The Tonkinese was first recognized as a breed in Canada in 1971, by the Canadian Cat Association (CCA). In the United States, the breed was first accepted by The International Cat Association (TICA) in 1979. In 1984, the Cat Fanciers Association granted the breed championship status. The American Cat Fanciers Association (ACFA) also recognizes the breed.